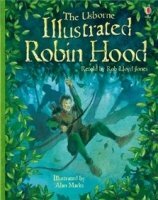 Re-live the treasured stories of Robin Hood in this captivating storybook. Join Robin Hood and his Merry Men in two daring escapades: ‘Robin and the Sheriff’s Gold’ and ‘Robin and Much’. Contains a fascinating, illustrated introduction to life in the Middle Ages in a separate section at the back, where children can learn more about the men who are thought to have inspired these stories. With its padded jacket and atmospheric illustrations, this book will make a perfect gift.